NuForce's Cube, for now, is a unique little product that we're happy to recommend to those travelers and outdoorsy types that need a compact, great sounding speaker. If you were to do a quick internet search for “portable laptop speaker,” you’d be treated to a buffet of embarrassingly poor-sounding pieces of glorified plastic that, sadly, probably do sound better than the speakers built into your average laptop. Outside of the privacy of one’s headphones, the frequent traveler, camper or otherwise enthusiastic adventurer has few options for enjoying music from their portable devices when storage space is at a premium; especially if they wish to share their tunes with others. Enter the NuForce Cube. At $120, it’s a portable, battery-powered speaker, DAC and headphone amplifier all wrapped up into a tiny aluminum-clad cube that fits in the palm of your hand. The NuForce Cube’s 58.5mm x 58.5mm x 60mm aluminum cabinet is available in black, silver, red or blue with a color-matched cloth grill. Four rubber pads on the bottom of the device keep the otherwise silky smooth cube from sliding around on surfaces. The Cube packs 3 watts of power for what appears to be a roughly 1.5-inch speaker (NuForce doesn’t disclose the driver’s actual dimensions). Accessories include a 24-inch stereo 3.5mm cable, a 28-inch USB cable, and a soft carrying pouch. An optional adapter for the iPod Nano is also available. A rechargeable battery tucked inside the NuForce Cube is charged by way of USB and is said to last 8 to 10 hours per charge, depending on how much you crank it up. Listeners have two input options: a USB port allows the connection of a computer and a 3.5mm (headphone-style) jack will handle just about any other audio device, though it will most likely be used with mobile phones and other portable media players. 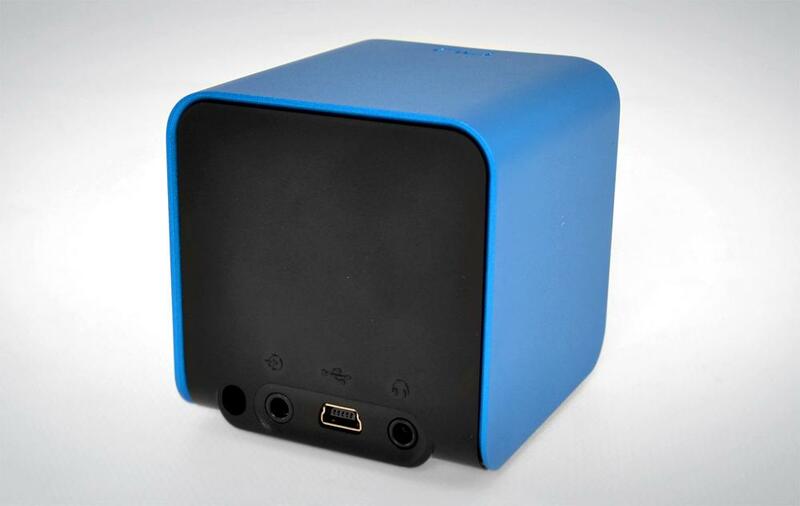 When the NuForce Cube is connected via USB to a laptop or desktop computer, the computer’s internal sound card is bypassed in favor of the DAC (digital-to-analog converter) built into the Cube. For those with horrendous-sounding laptops (yours truly included) the appeal of an outboard DAC is huge; it can make a tremendous difference in sound quality. For those with quality sound cards built into their computers, the allure is a little less potent. Devices connected to the analog input, on the other hand, get no love from the Cube’s DAC, though NuForce does indicate the internal amp will give the sound signal a bit of a boost. NuForce sent us a sample of its Cube a week ago and we’ve had plenty of fun playing around with it. 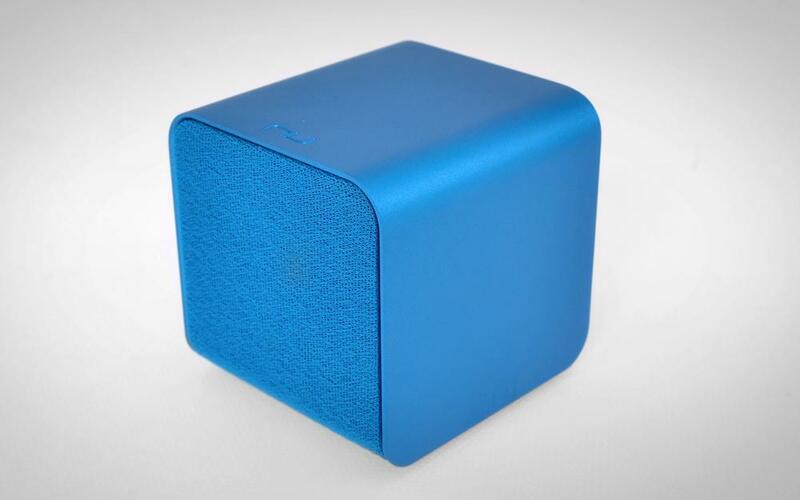 The Cube is undeniably cute yet smartly designed and looks good just about anywhere it sits. Until folks get used to seeing such a thing, the Cube is bound to attract attention — it certainly did for us. The speaker itself sounds quite good. Getting so much sound from such a pint-sized package is undeniably cool, but NuForce’s latest offering offers more than just cool-factor as it sounds remarkably clean and accurate throughout its performance range. That said, it does sound small-ish in that it can’t play the lower midrange, midbass and bass frequencies that serve to give audio that sense of “fullness” with much gusto. Still, bass is represented to a small degree. Bottom line: this is the best sounding self-powered micro-speaker we’ve come across yet. The NuForce cube’s built-in DAC does its job pretty well, but those with decent sound cards in their PCs won’t notice a quantum leap forward in performance, per se. Our Dell laptop’s on-board sound is extremely bad, replete with overblown bass, gobs of muddiness and zero detail. That being the case, the increase in sound quality as experienced through the cube with our Yamaha EPH-100 in-ear headphones was easily distinguished and very welcome. Bass was tightened up, mud was gone, sparkle was restored to treble and vocals sounded natural. With our desktop PC, which is equipped with an M-Audio Audiophile 192 sound card, the difference was less stark (we should point out that the M-Audio card is one of the better-sounding cards we’ve used). For grins, we also compared the performance of the NuForce Cube to NuForce’s Icon uDAC-2 and HeadRoom’s Micro DAC and Micro Amp combo. We found that the $129 uDAC-2 (a travel-sized USB powered DAC/headphone amp) sounded a bit better, with stronger bass response, better vocal presence and a bit more headroom. The $600+ desktop-style HeadRoom combo offered a bit more bass as well, much more headroom and more accurately reproduced transients. We also ran an A/B comparison between a direct connection to our iPhone and one that routed the iPhone’s output through the NuForce Cube’s headphone amp. Here, the difference was minute, at best. To determine whether any difference was made would require some objective measurements. Suffice to say that running an iOS device through the Cube isn’t going to fix what ails your iPhone, iPad or iPod touch where sound quality is concerned. It will, however, allow you to enjoy audio from any portable media player just about anywhere you can imagine. For grins, we tied in a second NuForce cube into our mini-system by splitting the output of our iPhone with simple Y adapter. With two Cubes working together, we got a bit more bass support and a fuller sound in general. But, at $240, such a rig could hardly be considered cost-effective. While higher quality and similarly-priced portable DAC’s do exist (the uDAC-2 is a good example), we can’t think of any others that come packaged with a respectable sounding speaker and quality headphone amplifier in such a tidy little package. NuForce’s Cube, for now, is a unique little product that we’re happy to recommend to those travelers and outdoorsy types (or anyone else for that matter) that need a compact, great sounding speaker solution that can pull off more than just one trick.